We need another great Account Manager – is it you? Spring is looking for an ambitious PR Account Manager, looking for the next stage in their career based in one of the most beautiful areas of the country. An innovative strategic communications design agency, Spring has its base in the seaside town of Southwold, Suffolk. You will be supporting the PR Account Director and Digital Account Director to run Spring’s Hyperlocal Everywhere Network, a national network of PR agencies that deliver Government campaigns, and will be the day-to-day contact for some of our most prestigious clients including Anglian Water, National Citizen Service and Hopkins Homes. Spring has won the tender to work on the Nursing and Midwifery Council’s rollout of the new standards for education. This work will include digital and printed documents, collateral for exhibitions and digital and print ads. 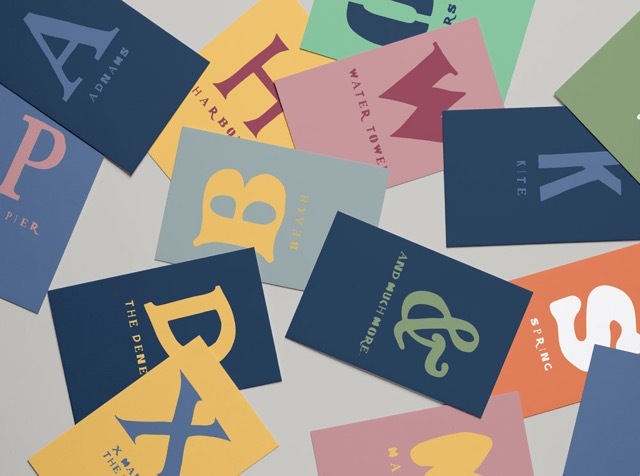 Spring responded to the brief by showing how the brand could be developed through the use of illustration, and how we could use the colour palette to help users navigate documents. 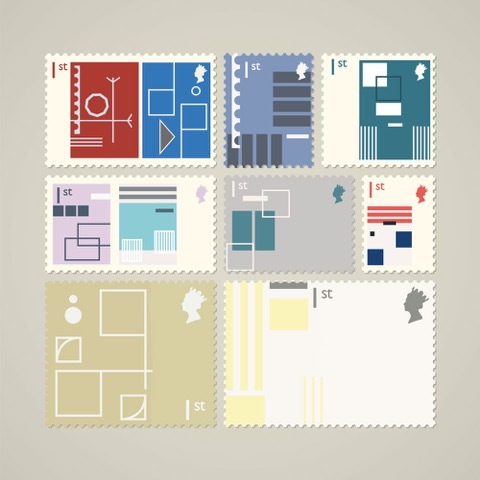 The winning illustration style is simple, yet effective, and will be developed over time to become an important part of what underpins the NMC brand. We’re excited to be working on this project and look forward to getting started in February! 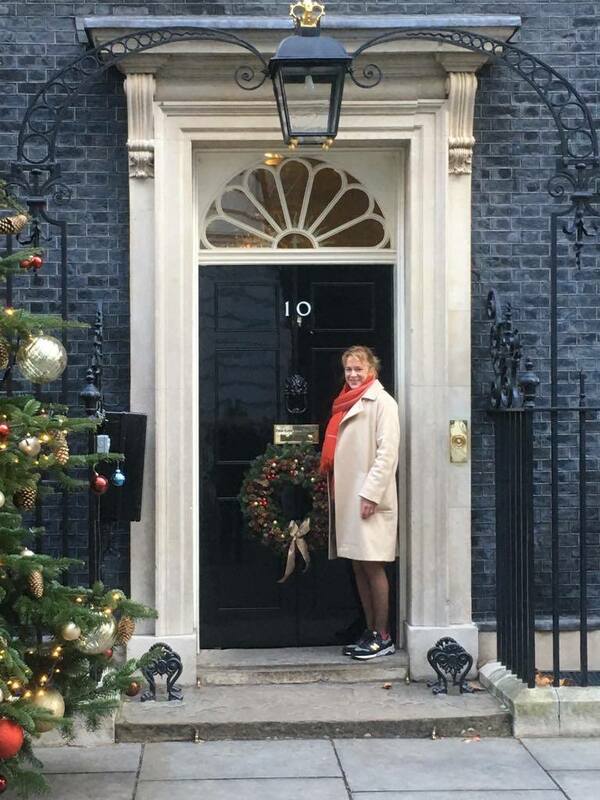 The week before Christmas I delivered a workshop at Number 10 Downing Street for the Cabinet and PM’s Office Local Campaigns and Insight Team, helping them identify ways to understand and engage with varied communities across the UK. Sharing examples of campaigns undertaken by Spring and other agencies in the Hyperlocal Everywhere Network, I gave insights into how we go about getting to know geographic and demographic communities better. Sometimes we do this for public and third sector, sometimes for brands who are keen to make their budgets more efficient and their messaging more effective. I shared with them the seven principles of Influence cited by Robert Cialdini: namely reciprocity, scarcity, authority, consensus, commitment, liking and unity. He devised the initial list of six thirty years ago, and brought in ‘unity’ only last year; it’s also worth noting that ‘authority’ has changed beyond recognition recently, with traditional establishment bodies crashing in trust, and ordinary people growing ever more influence through social media. Whilst our own policy is to undertake our research on-the-ground and face-to-face wherever possible, clearly there are constraints to that for government communications teams. So it was good to share insights to real community influencers – the day to day voices of authority, the community glue. We discussed how to find them and harness their connections to deliver information into communities and consult on their needs and views. It was a great pleasure to bump into Larry the cat on the way out, who nonchalantly sauntered in when the door was opened for me to leave. He was distinctly unimpressed by my attempts to make small talk. H2OMG! Spring are Cream of the crop. We’re delighted to announce our H2OMG event we ran for Anglian Water in the summer has won GOLD at the Drum Cream awards. The awards, run by The Drum (Europe’s biggest marketing website), were held in Birmingham on 22nd November, and are designed to reward the very best talent in creative advertising and design across the Midlands, East, South West and Wales. We entered in the Environmental/3D Design category and took the top award. H2OMG was Spring’s creative response to Anglian Water’s brief to create a stand-out interactive environment to support the public consultation for their five-year investment strategy, a plan to future-proof the region. 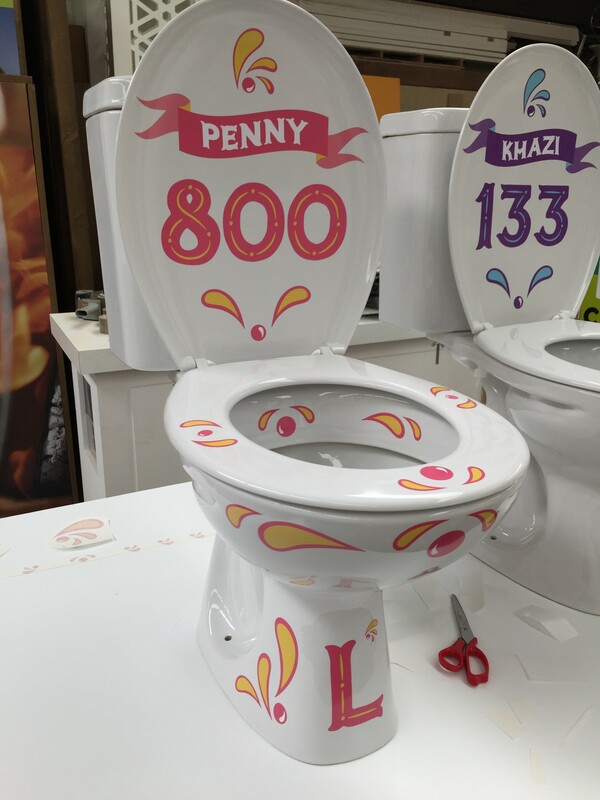 The event leveraged the fairground theme in design, games, and handcrafted stands and giant hand-painted 4m tap to welcome 33,000 people over 5 days and exceed all KPIs. To get a flavour of the fun we had at the fair, watch the video below. And if you want to find out how Spring can help you reach your audience, contact us here. If you were watching the undercard fight of Warrington vs Ceylon between Craig Poxton and Lyon Woodstock last month you may have seen a familiar name in the ring. Craig is a Lowestoft fighter who trains at Ultimate Boxing, a gym also used by Spring founders Erika and Simon. Now one of our clients, Ultimate Boxing is growing across Norfolk and Suffolk, teaching boxing and boxing-based fitness to all members of the community. Owner Matt Smith offers expert coaching at all levels, from complete beginners to professional fighters such as Poxton, and also runs general fitness classes to improve cardio, help weight control and build strength. Making boxing accessible to everyone is Ultimate Boxing’s ultimate goal. It provides tailored off-site training for schools, colleges, hospitals, councils, community groups and companies, and encourages people who are excluded by traditional boxing clubs, or who feel uncomfortable in larger chain gyms, to take their first steps in this exciting and rewarding sport. Sadly on this occasion Poxton wasn’t victorious, losing on a judges’ decision at the end of an epic fight over ten, hard-fought rounds. It’s been a good week for seeing our work out and about. 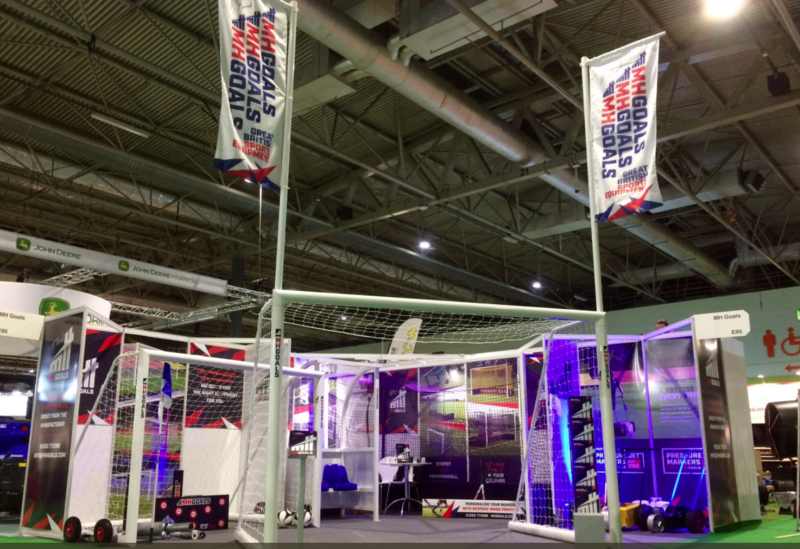 Firstly, this is the stand we designed for MH Goals exhibition at Saltex, held in Birmingham’s NEC over the last two days. It’s the UK’s biggest event for grounds care, sports, amenities, estates and green space management, but even sharing the hall with over 260 exhibitors we think it stands out. 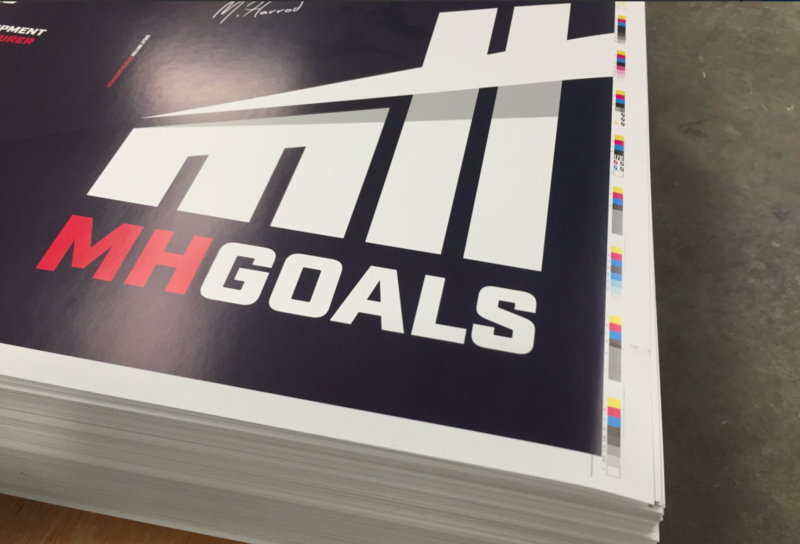 As well as being able to view MH Goals products and get expert advice about sports safety, visitors to the stand could pick up the new MH Goals catalogue, also designed by Spring. It’s 100 pages long – 25% bigger than last year’s edition – and only came off the presses the week before. After months of designing, planning and implementing our event for Anglian Water promoting water resilience was a huge success, with over 31,000 people attending the event at the Forum in Norwich across six days. The event, called H2OMG, was Spring’s creative team response to Anglian Water’s brief to create a stand-out and engaging environment to support the public consultation for their five-year investment strategy, a plan to future-proof the region and build a resilient infrastructure. 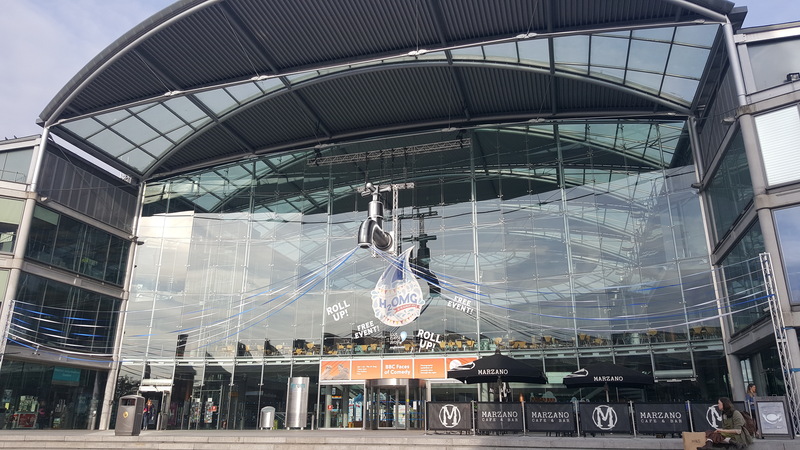 A giant 4.5m tap was hung on the city centre building and family-friendly fairground stalls were created to educate the public about Anglian Water’s approach to sustainability. 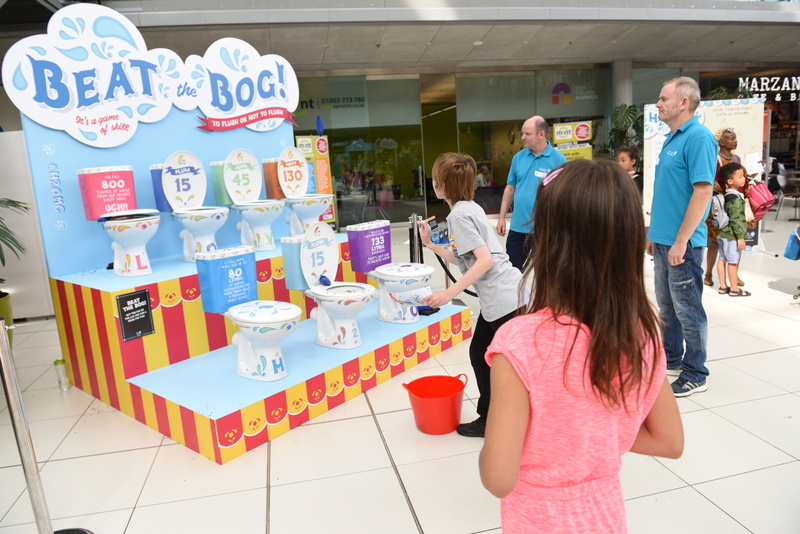 This included Beat the Bog, a game that challenged the public to throw bean bags into loos to reveal facts about water usage in the bathroom, a Water Wheel of Fortune and touch screen quiz, Test the Water. The event was a great success and exceeded all targets. H2OMG welcomed 31,000 people over six days, achieved 21,000 active engagements across all the stalls, generated a media reach of 3,287,000 and 24,000 social media interactions. The data captured will now be used to help inform the company’s plans for ensuring the Anglian region has a sustainable supply of water for decades to come. It’s wonderful to see the City of Stories brand we created for Norwich nearly three years ago going from strength to strength. This video is their latest release, and features a technique dubbed ‘Flow Motion’. Made by BAFTA winning filmmaker Rob Whitworth (BBC Planet Earth 2) who studied in Norwich, it’s a stunning way to view the cathedral and is due to feature strongly in Visit Norwich’s next digital marketing campaign. Maddy has just finished the second year of her degree in Graphic Design at Norwich University of the Arts. In June, she spent two weeks interning in our studio and got her teeth into her own design project. “The brief was to design and create a beautifully crafted range of products to promote Southwold and Spring, with Southwold’s tourists being the main audience for the products. The brief began with the idea of ‘Southwold in Type.’ Using type found around Southwold, I created a hand-crafted typeface drawn from letters found anywhere from shops on the high street to beach huts and The Pier. Once the typeface was drawn and then created digitally, I designed a range of postcards using the letters with Southwold and beach specific words on them e.g. A for Adnams. 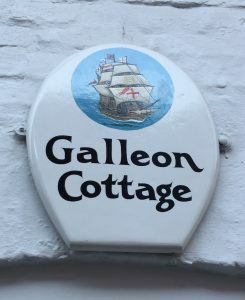 I then considered how the designs could be used across a range of products such as tote bags, towels, mugs, t-shirts and posters and become a special gift that tourists can buy and take home with them to remind them of their time in Southwold. After getting this project to a point that I was happy with and felt fulfilled the brief, I decided to pursue an idea I had had prior to my internship at Spring. Iconic to the town, the row of beach huts lining the promenade is something that any local or visitor would recognise instantly. And, with each of Southwold’s beach huts being ever so slightly different, I thought that it would be interesting to represent them in their simplest, most graphic form. I took photos of lots of the beach huts in Southwold and then chose a select few to illustrate, using a very minimal and geometric style. Similarly to the previous project, I also applied my designs to merchandise such as bags, t-shirts, posters, stamps and stationery. I also began to develop how this could be expanded into a game for children in which they have to find the beach huts based on the illustrations. I thoroughly enjoyed working on this brief during the two weeks I spent at Spring and have learnt a huge amount from the experience. 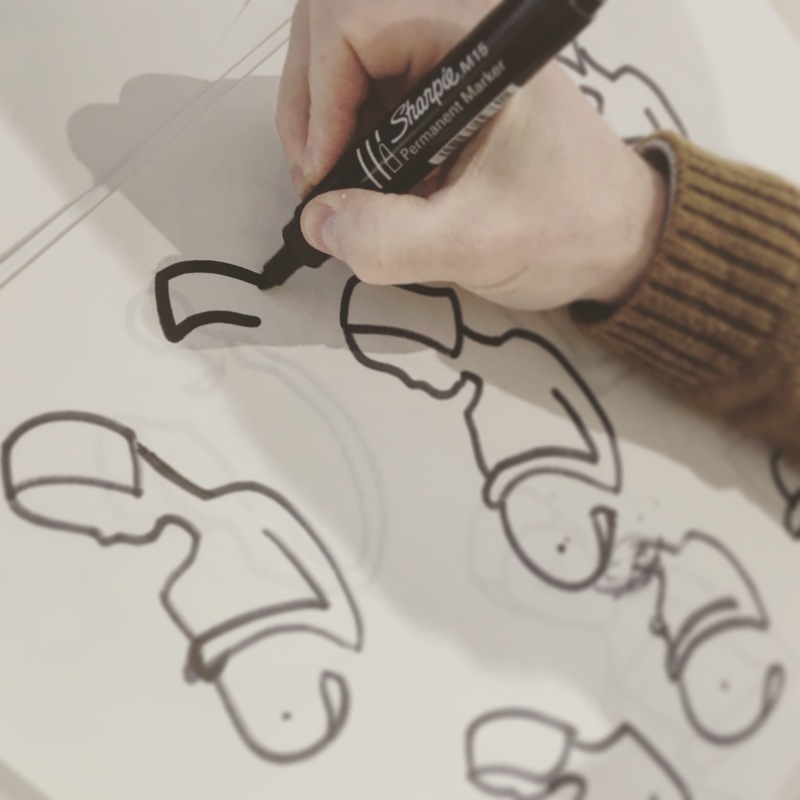 Being given my own brief to work on over my time there, and feedback from their team throughout, allowed me to develop an idea from the initial stages through to a final design whilst also learning a lot about daily life in a design studio. We’re delighted to have renewed our contract for tourism marketing with the Moroccan National Tourist Office after three successful years of working together. The new contract will see us continuing to develop the country’s award-winning MuchMorocco brand concept. 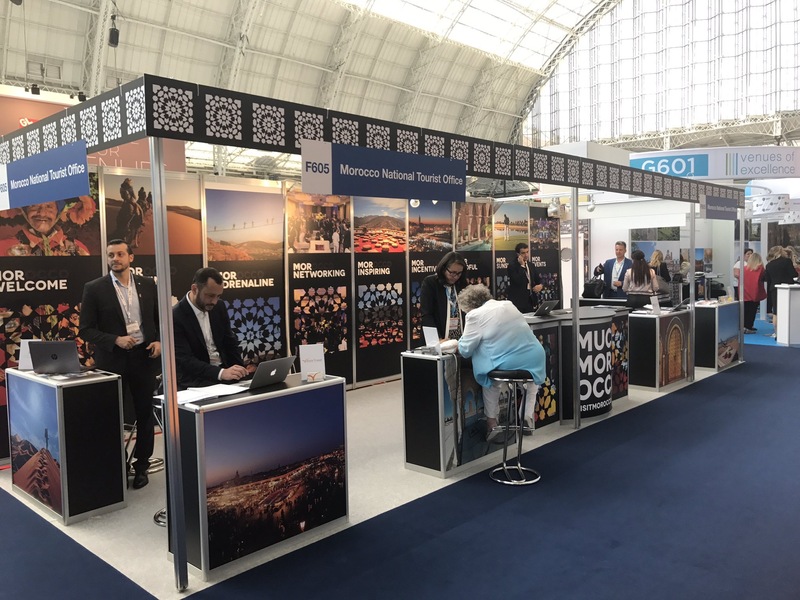 The brand, which we originally launched in November 2015, will continue across print and online media, as well as travel trade events including last week’s Meetings Show at Olympia, at which Morocco appeared alongside 700 other destinations for business travellers. MuchMorocco has won a number of high profile awards including Gold for Best Visual Identity for Tourism and Leisure at the Transform Europe Awards, and Gold for Best Creative Strategy at the Transform MENA (Middle East and North Africa) Awards. 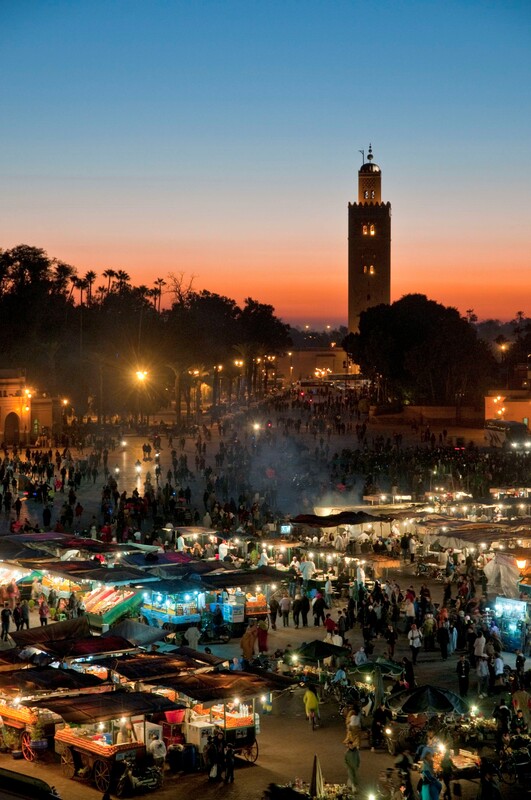 We brought the MuchMorocco to life digitally via a website and social media, as well as across print and outdoor, amplified by several competitions and co-marketing exercises. We also delivered a content strategy through travel bloggers and photographers as well as our in-house editorial team. The concept was initially rolled out at World Travel Market 2015 and has been well received by travel trade and consumer audiences alike. Our close working relationship with head office in Rabat has seen them develop the brand for communications across a number of additional markets including Russia and China, working with specialist translators to deliver bespoke communications that have relevance to their target market. Since last autumn, we’ve been working with Felixstowe-based European haulage business Jordon Freight to create a new brand to support their ambitious plans for further growth. Recently, their brand relaunch was completed as their new website went live. Jordon approached us back in September last year, looking for something that would set them apart from their competitors. We started by getting to know them, their market and the opportunities they had, better. 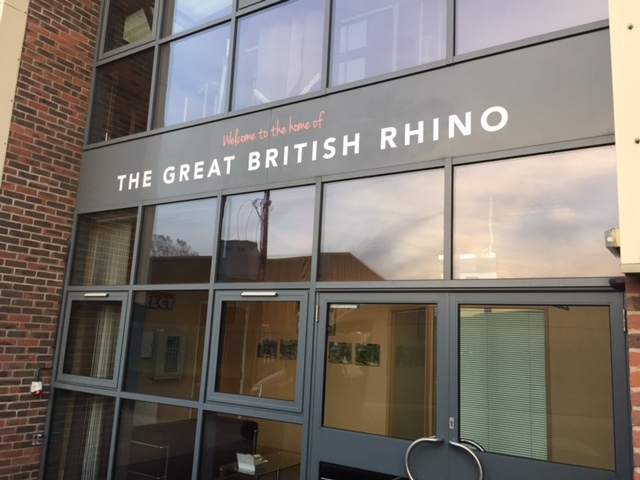 Part of this saw us carry out a customer survey, in which we talked to a selection of Jordon’s clients and discussed what they thought set them apart from other companies offering similar services. We also met the whole Jordon team for a project launch workshop where we identified their approach and motivations. What came out of this phase was a clear insight: the fact that nothing stands in Jordon’s way when it comes to meeting their clients’ promises. 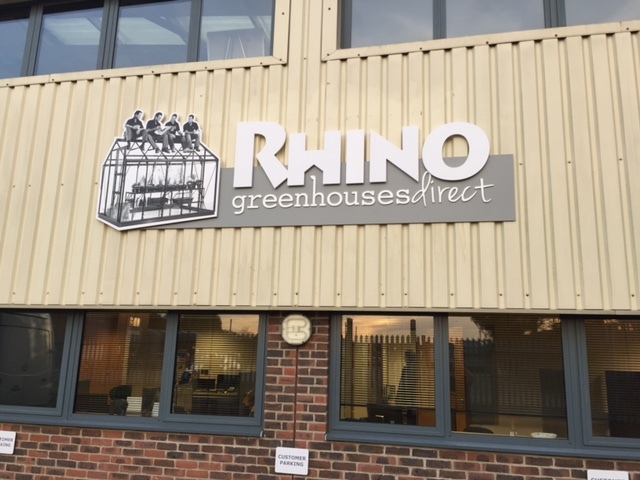 Their determination and resilience means that the level of customer service they deliver is second to none, and this was something we knew we had to communicate through the new brand. 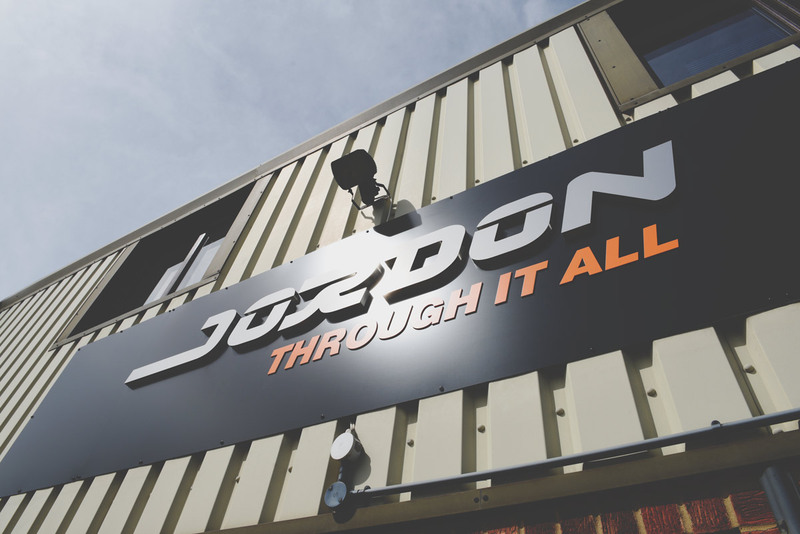 We came up with a positioning statement that represents their gritty dedication to going over and above to deliver: ‘through it all.’ In terms of the appearance of the brand, we had realised during the research process that people recognised the Jordon logo and it had real equity. Therefore instead of starting from scratch, we made the decision to evolve the logo into something more robust and evocative, with a chrome and orange colour palette. 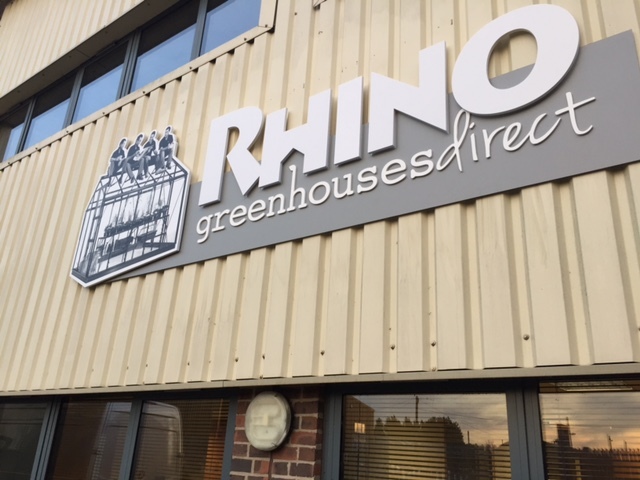 The next stage was to think about how the brand would be applied, and through this process we decided on a brochure, stationery, merchandise and crucially, a new website. Every brand asset has to underpin Jordon’s rugged functionality. 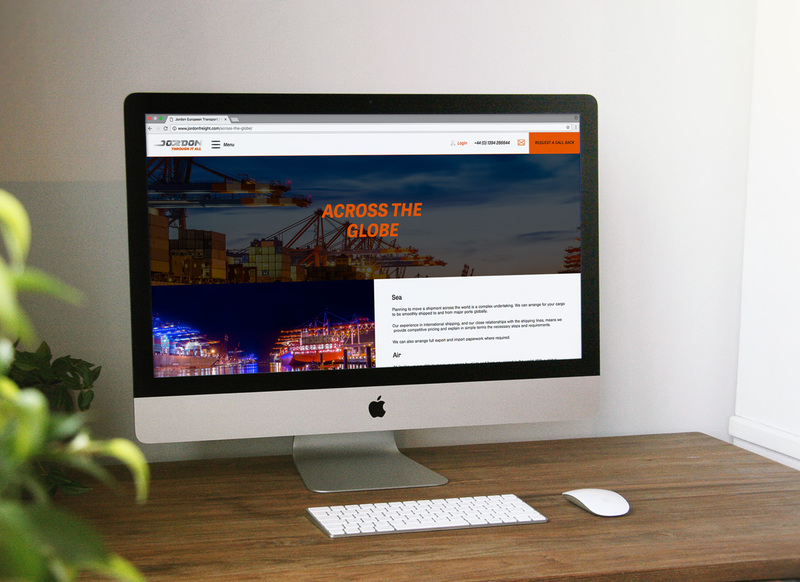 Their new site is fully responsive and highly intuitive for visitors, with the main aim of making it as easy as possible for people to navigate and for Jordon’s sales team to provide them with quotes. A video banner on the homepage emphasises the ‘Through it all’ message, with ‘dashcam’-style footage of a lorry battling through extreme weather conditions. Another phase of the project has been refitting Jordon’s offices. Naturally, as the environment in which Jordon’s customer services team operate it’s an important part of the Jordon brand, so it was important for the new look to be embedded in this space. With the Jordon team such a key part of the service they offer, it was also important that the brand really resonate and mean something to them. They’d been involved in the journey from brief to completion and we drew everyone together to present the process, insight, design solution and applications – the team has really taken the new branding to their hearts, even wearing corporate orange to external events to support the brand! We’ve worked closely with Norfolk’s Houghton Hall on the marketing strategy and design for the acclaimed EARTH SKY, Richard Long at Houghton Hall exhibition. 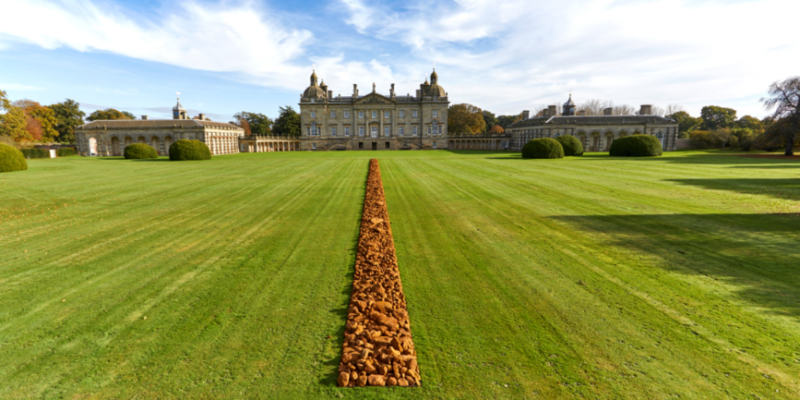 Considered one of the most important artists of his generation, Turner Prize-winning British landscape artist Richard Long has conceived and created each piece for its own particular place in the house and grounds of Houghton Hall. The exhibition opened on 30th April and runs until 26th October 2017. EARTH SKY is the third of these large-scale exhibitions at Houghton Hall, following on from Houghton Revisited (2013) and James Turrell (2015). David, Marquess of Cholmondeley has a passion for art and a strong desire to share it with people in the setting of his spectacular home, saying “My hope is that in time Houghton will become a ‘must-see’ destination for those interested in contemporary art and sculpture”. Project objectives include raising the profile of the exhibition, encouraging visitors to book ahead for the event, bringing more families to Houghton, creating a legacy that increases awareness of Houghton as a home of high quality contemporary art and supporting effective partnership, sponsorship and education programmes. Spring has also developed the concept of beLong, a Heritage Lottery Funded-project to introduce local school-aged children to the exhibition and Norfolk’s material heritage. 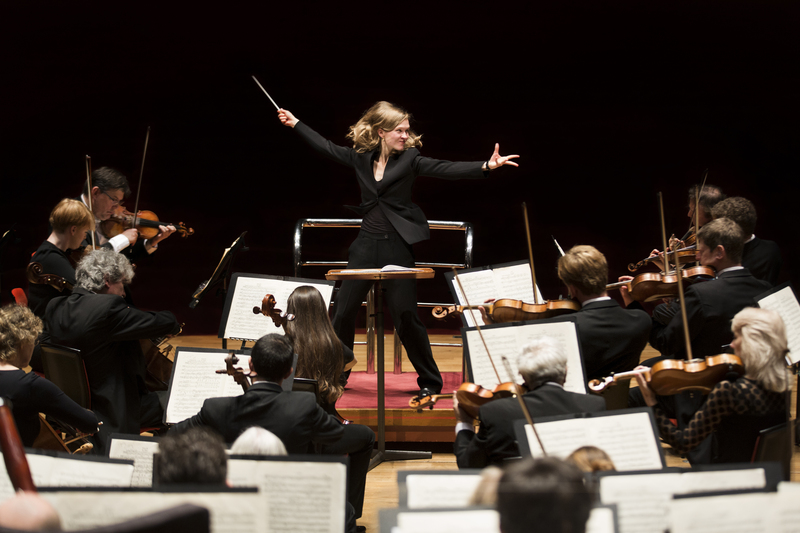 As summer approaches, the East is gearing up for another season packed with world-class cultural events. Spring’s cultural tourism project, Look Sideways East, has drawn together its cultural highlights for the summer, bursting with must-see festivals, exhibitions and events for visitors from both near and far, and we thought we’d share them. Pulse Festival – Ipswich. 1-10 June 2017. Part curated, part open application festival, offering inspiring contemporary theatre across a variety of genres, from theatre to dance and everything in between. Aldeburgh Festival – Snape Maltings. 9-25 June 2017. The world famous Aldeburgh Festival turns 50 this year and celebrates with 17 packed days of classical music, walks, talks, films, exhibitions, over 30 non-classical events at The Pumphouse fringe and free music every lunchtime on the beach. Felixstowe Book Festival. 1-2 July 2017. Now in its fourth year, patron Esther Freud describes this bright, breezy and diverse literary festival by the sea as “a flourishing festival, with a programme to catch the imagination.” 2017 programming largely t.b.c. but will include Stella Rimmington and Louis de Bernieres. Latitude – Southwold. 13-16 July 2017. Latitude Festival is now in its second decade and showcases world-famous artists alongside the hottest up-and-comers, plus a huge offering of family friendly theatre, dance, film, cabaret and literature. FolkEast – Glemham Hall. 18-20 August 2017. This independent celebration of world-class folk music at glorious Glemham Hall is full of heart and humour. “One of the best world music, roots and folk festivals in the UK” – Guardian. 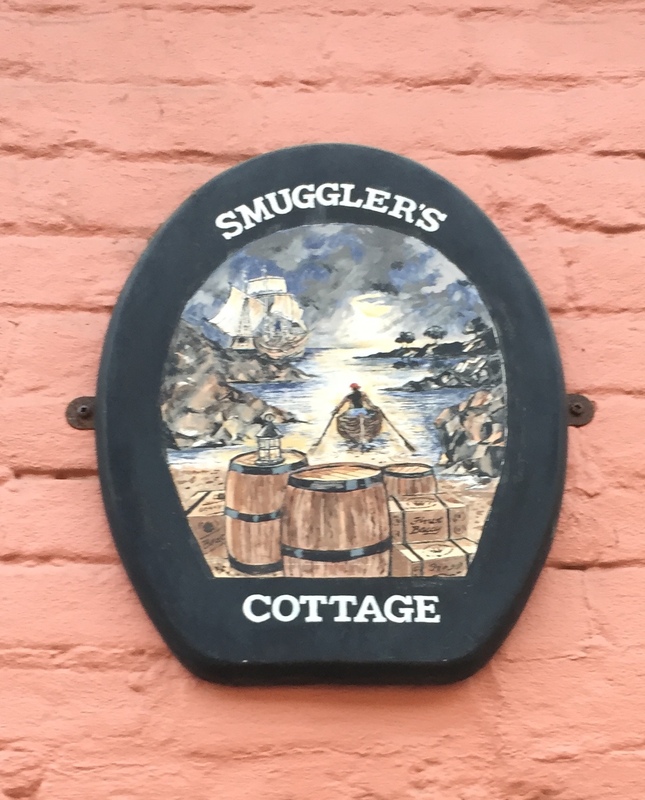 High Tide Festival – Aldeburgh. 12-17 September 2017. The renowned annual festival for world premieres by theatre’s most exciting, adventurous and diverse new voices. Noirwich – Norwich. 14-17 September 2017. Britain’s boldest, bloodiest crime writing festival returns to the medieval lanes of Norwich – a killer chance to hear from and meet both the leading and top emerging names in crime fiction with talks, Q&A’s and workshops. OutThere Festival – Great Yarmouth. 15-17 September 2017. Stunning, world class circus fills the streets of Great Yarmouth. FlipSide Festival – Snape Maltings and Lowestoft. 6-8 October 2017. The sister festival of FLIP, South America’s largest international literary festival. The Latin beat comes to Suffolk as directors Liz Calder and Genevieve Christie mix music with literary debates and walks, poetry, art, film and food for all ages, plus a fantastic jungle trail for the youngsters and the famous FlipSide Friday night party. God’s of Sport – Palace House, Newmarket. Until 18 June 2017. Celebrated photographer Chris Smith has devoted half a century to capturing the drama, beauty, challenges and elation of sport. This exhibition celebrates his work on subjects including Muhammad Ali, George Best, Ayrton Senna, Seve Ballesteros, Lester Piggott, Sir Henry Cecil and the Olympic Games. Richard Long at Houghton – Houghton Hall, Norfolk. Until 26 October 2017. Houghton Hall hosts a major exhibition by Turner Prize-winning land artist Richard Long this summer, his largest since 2001’s Tate show. 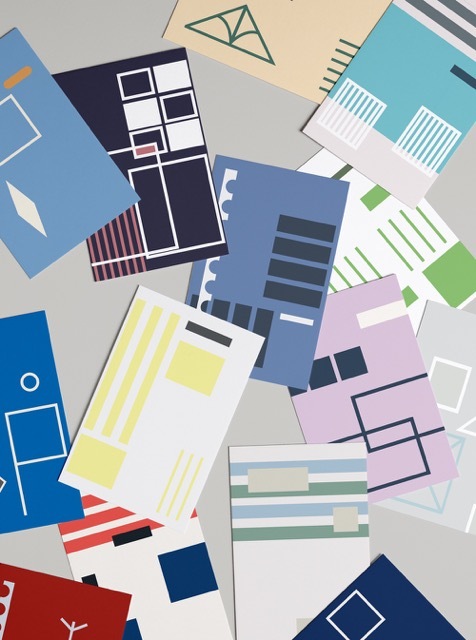 Long has created a series of site-specific works for the grounds, house and stables. Gainsborough-Constable Trail. Suffolk. Launched Spring 2017. Both artists called Suffolk home and this new trail guides visitors around ten locations of historic importance and the landscapes that inspired them, including Gainsborough’s House, Flatford Mill and Christchurch Mansion. Nelson at Norwich Castle. 29 July–30 September. A collection of the most extraordinary and potent objects connected to Admiral Lord Nelson, reflecting his naval victories, his relationships and above all his affection for his native county of Norfolk. Rembrandt: Lightening in the Dark – Norwich Castle. 21 October 2017-7 January 2018. An important new exhibition – featuring the collection of 93 Rembrandt etchings held by Norfolk Museums Service. Russian Season at the Sainsbury Centre – Norwich. 14 October 2017–11 February 2018. Two major exhibitions – Fabergé and Avant-Garde Russia – mark the 100th anniversary of the Russian Revolution. 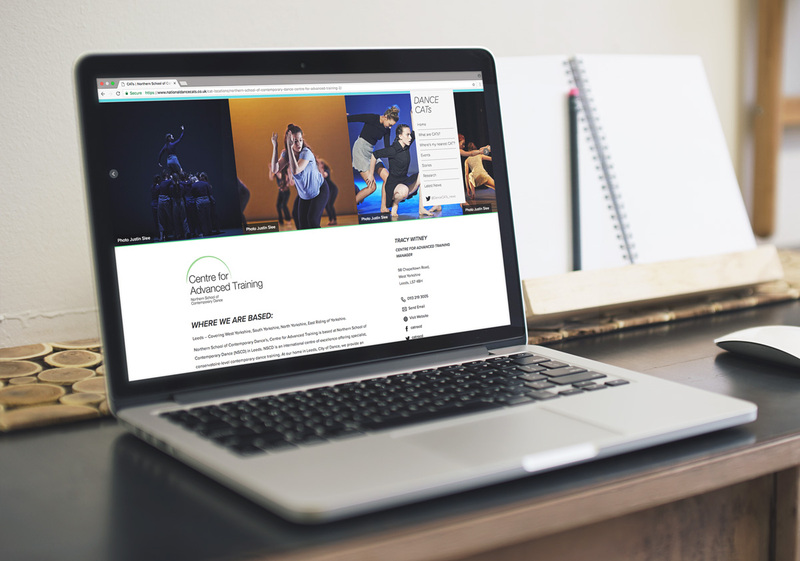 Building on our fantastic work with DanceEast, Spring recently completed a brand new website for the National Centres in Advance Training in Dance (CATs). The CAT scheme, funded by the Department for Education, provides gifted young dancers the opportunity to benefit from world-class professional training without having to relocate. The network covers the entire country, so students never have to travel too far to attend. When Spring started working with the network, they were all unanimously unimpressed with their existing website. They felt it was outdated, unambitious, and most alarmingly, uninspiring. Spring was tasked with creating an exciting, easily navigable site that would communicate the quality of the CATs, and most importantly, allow current students to share their experiences of life as a CAT. 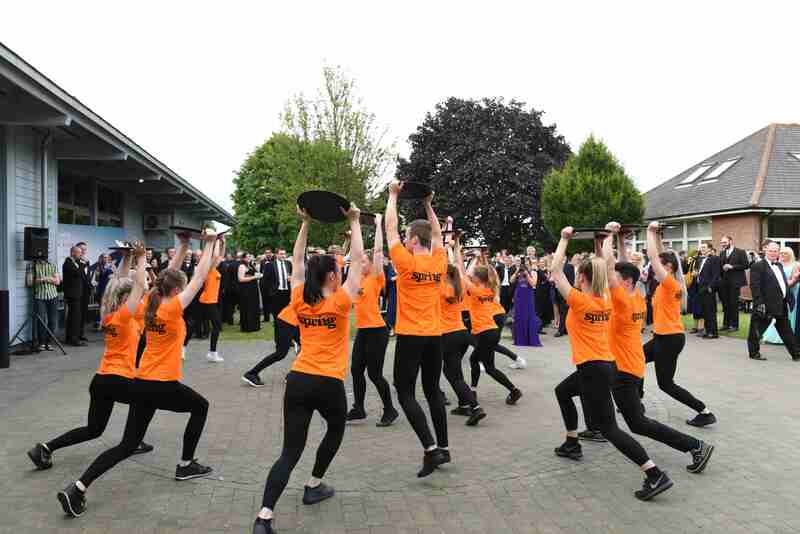 We’re proud to give the National Dance CATs a website that represents their world-class, professional offer, and we can’t wait to see how it helps them advocate for future projects, as well as recruit the country’s finest young dancers. The East of England Co-op has marked the tenth anniversary of its Sourced Locally initiative with a portrait celebrating the women at the head of the East’s food and drink industry, including two of our fantastic clients. 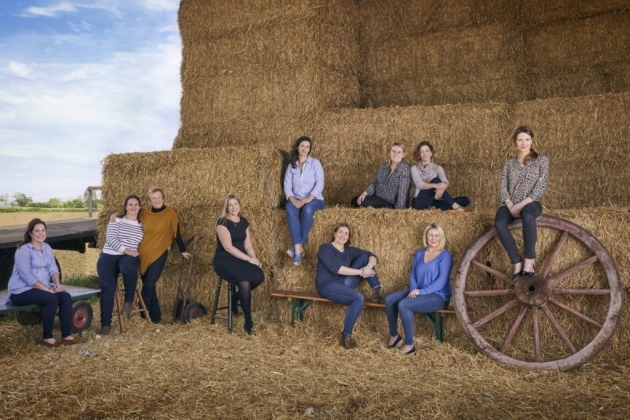 With around 30% of the food and drink manufacturing workforce in the UK being female, it’s important for the region to champion its female producers, and that’s exactly what the East of England Co-op’s new portrait will serve to do. The 10 women in the portrait are all entrepreneurs spearheading the region’s food and drink industry, and include two of Spring’s clients: Fiona Brice, joint director at Havensfield Eggs and Hannah Marriage, director at Marriage’s Flour, alongside others including Emily French, business partner at Foxes Farm and Sarah Savage, founder and director of Essence Foods. Created as part of Sourced Locally Fortnight, which takes place annually to highlight to customers just how important local products are, the portrait was organised to mark 10 years of success for the Sourced Locally scheme. It was shot by renowned photographer Jenny Lewis, who went into the project in the hope of inspiring a new generation of businesswomen in the region. Launched in 2007 following the discovery that South American asparagus was being sold in stores mere miles away from fields full of the British crop, the Sourced Locally scheme has led to a £57 million boost for the region’s economy. The East of England Co-op’s Sourced Locally Fortnight runs from 5th-18th June, and will see participating stores across the region welcome local suppliers to talk to customers about their produce and encourage them buy locally produced items. Are you a future Springer? Are you a bright, ambitious and talented graduate looking to launch your career in a successful agency with amazing clients and a fantastic team? Then we want you to join us at Spring! Research, plan and execute PR and social media campaigns in collaboration with senior Spring team, including supporting with events. Talk to Springers and unearth great news items and insights for appropriate digital channels and traditional media, craft them with team support where needed, and seed across digital and traditional media networks. Assist with research and development of awards entries for Spring and its clients, and manage Spring’s awards entries calendar. Assist with developing opportunities for key Springers to attend, host, speak at and otherwise contribute to events, and for written, spoken and other contribution to traditional and digital media. Work on PR and social media activities for new and existing clients. Write press releases and content, or brief other members of the team, distribute and/ or upload in a way that encourages take up, follow up and record coverage and responses. This across print, broadcast and social media as appropriate to content and audience. Help with building database of useful contacts and maximising value of paid-for services. Undertake daily searches and alerts for Spring and clients’ businesses, file coverage in a shareable way, maintain a reference library. Attend internal meetings, project briefings and others as invited. Support with daily tasks like collecting papers, answering phones, greeting and settling visitors and other office support. Spring is the east of England’s leading strategic communications design agency. We call ourselves the Agency for Change because we work in partnership with our clients to smash their targets. They are widely varied and include the Moroccan National Tourism Office, Adnams, EDF Energy and Houghton Hall. As lead agency in community engagement specialists, the Hyperlocal Everywhere Network, we are on the government’s communications roster. We only recruit people who bring excellence, passion and commitment to the team, completely buy in to our culture and will help us meet our ambitious plan for growth. 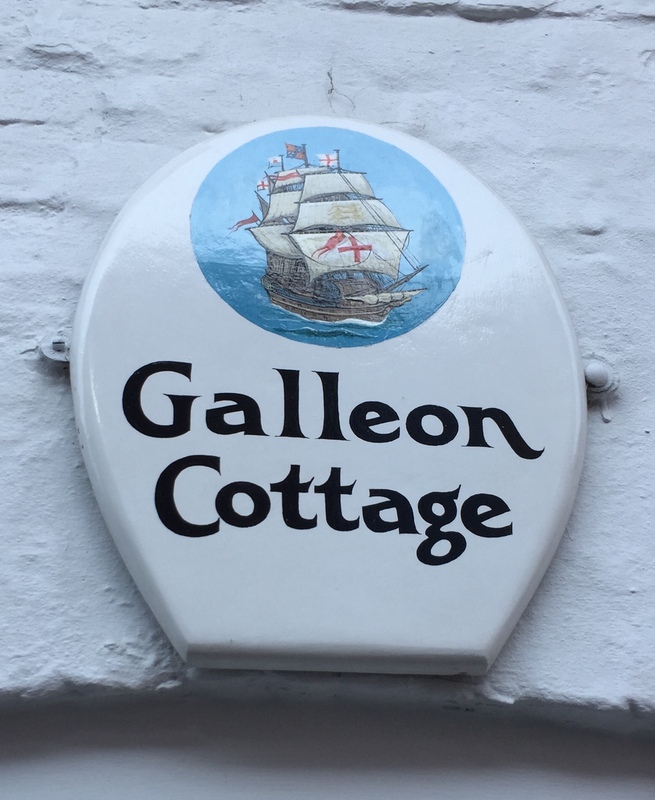 In return we offer a rewarding working environment as part of a bright, supportive and successful team, fitness sessions, cultural expansion grants, talks from industry heroes, generous training provision – and of course a glorious location, in Southwold, on the Suffolk coast. To apply for this position please supply a letter setting out your ambitions, ethos and why you’d like to work for Spring. This is a year-long opportunity, starting in July, and enjoying an entry-level salary. Applications to su@agencyforchange.co.uk. We are absolutely delighted to welcome new Account Director Gene Chui to the Spring team. Formerly Account Director at global communications agency Ketchum in London, Gene has worked on campaigns including Nissan’s sports sponsorship programmes and Proctor & Gamble grooming. He brings with him invaluable strategic communications experience in leading integrated teams on PR, events, digital and design. His previous work has been across a wide variety of sectors, including food and drink, sports, fashion, healthcare, beauty, entertainment, retail and technology; developing brand strategies and creative ideas, delivering campaigns, event production and social media strategy. He also finds the time to combine running marathons with being a real foodie. A Norfolk local, Gene grew up in Great Yarmouth and attended Norwich School before heading to the London College of Fashion. It’s great to have him back in the East!